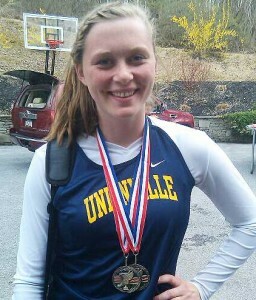 Unionville's Susie Pancoast shows off her medals following the Viking Invitiational, Saturday. COLLEGEVILLE — A number of Unionville High School athletes possibly best-known for their exploits on the court turned in exceptional track and field performances, Saturday, at the Viking Invitational at Perkiomen Valley High School. Senior Susie Pancoast — who has starred for the Indians in basketball and volleyball — threw the shot put with a throw of 34 feet 10 inches for the win. After that she tossed the javelin for a third (110 feet 7 inches) and then finished the day off with a second place throw of 116 feet and 9 inches for the discus. These events are very specialized and to excel in all three is phenomenal. I have heard she has been referred as Susie “the arm” Pancoast. Susie is a three-sport athlete at Unionville High School which this day and age is unusual. Susie stars at volleyball and basketball for the Indians. Moria McEvoy a senior at UHS is also a three-sport star for Indians and placed 7th in the Javelin and 5th in the discus. 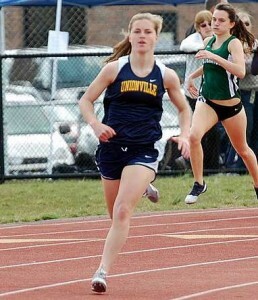 In the 400 meter run on Saturday, Kelsey McDonald breezed to a third place finish with a 61.40 according to PennXc.com. (My favorite web site to look at results) Kelsey just finished playing point guard this winter along with Pancoast and McEvoy for the girls UHS basketball team. Kelsey played soccer in the fall and plans on attending Longwood University in the fall of 2011. Kelsey said she felt although she had a little bit left and can run faster next time. She said she did not feel “completely dead” which is a good sign when running a race because it means next time you can go faster. It should be interesting to watch Kelsey run her 800-meter run this spring since with her speed and determination she should be one of the fastest girls in the state of PA.
Kelsey McDonald of Unionville competes in the 400-meter on Saturday. When scanning the results I was impressed to see a risng freshmen star named Allie Lane who ran a 12:27 two mile race which allowed her to place 11th on Saturday. Lane is part of a fantastic tennis family at Unionville and her Mother, Marty Lane is one of the best female tennis players in the Chester County region. For the boys Glenn Burkhardt, a senior on the UHS track team ran a spectacular 9:28.38 for the 3200 meter run and took the gold medal. His sophomore teammate ran a respectable 9:55 which was good for 6th place. Dima Curtis placed 2nd in both the discus and the shot put with 148 feet and 45 feet respectively. Curtis played on the football team in the fall as a defensive lineman. Up next for the boys and girl track team is a tri meet this Tuesday against Rustin and Oxford at Oxford High School beginning at 3:30 p.m. Conditions should be perfect at a high of 61 degrees on Tuesday with sunshine. Feel free to contact me at: Hannah@unionvilletimes.com if you have correction or track and field news that we should be writing about.